Our song, the Whole Grain Train, gets kids excited about whole grains! It’s the perfect sing-along for children in preschool and lower elementary classes, for scout groups, church groups, or any gathering of young children. The Whole Grain Train encourages positive attitudes toward healthy eating, and reinforces the idea that food should be healthy, delicious and fun — all at once! See how quickly your kids can learn the names of a dozen diﬀerent whole grains, and giggle along with some great ideas for eating those grains. Download MP3 of music, with chorus, all verses, instrumental accompaniment. Best for learning The Whole Grain Train, the ﬁrst time around. Download MP3 of music, with chorus and accompaniment (no verses). Invite your kids to make up their own verses, and sing them to the music. Download MP3 of music, accompaniment only. If your class or group would like to make its own recording, use this as a sound track, and add all your own voices. Download a PDF of the lyrics and sheet music, with chords. 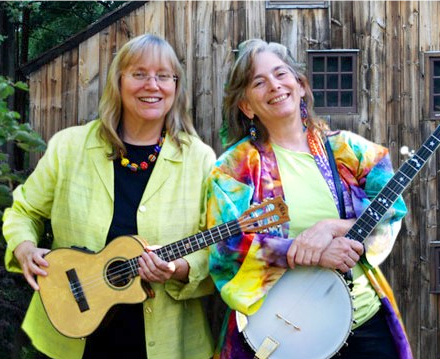 The Whole Grain Train was created for the Oldways Whole Grains Council by Cathy Fink and Marcy Marxer, talented singers and songwriters who bring together superb harmonies and instrumental virtuosity to entertain audiences of all ages. They’ve earned two GRAMMY® Awards, including one for their 2003 album “Bon Appetit! Musical Food Fun” — which inspired our Whole Grain Train song. Cathy and Marcy are also multiple prize-winners in the John Lennon Songwriting Contest, USA International Songwriting Contest and Mid-Atlantic Songwriting Contest. Learn more about Cathy and Marcy. We had fun working with Cathy and Marcy to create the Whole Grain Train song – and we hope you’ll enjoy singing it with the children in your life. We’d love to hear how you’re using the song. Did it help your students or campers learn about whole grains in a fun way? Did you make up any additional verses of your own? Email Caroline (caroline@oldwayspt.org) and tell us! The Whole Grain Train is © Cathy Fink & Marcy Marxer, 2 Spoons Music. ASCAP, 2015, all rights reserved. Available at no charge to non-commercial / educational organizations. For any commercial / for-proﬁt use, please contact Cathy & Marcy at info@cathymarcy.com.